There are any number of technologies that businesses use to communicate both internally, between employees and teams, and externally, with clients, suppliers and other stakeholders. Much of it, particularly email, can be a drain on productivity. This rapidly growing communication platform (over 2 million current users) brings your business communications all into one place. With it’s browser-based software and it’s real-time messaging app developed for both iOS and Android, Slack is transforming the way that businesses… do business. Found have been using Slack a little while now and we’d thought we’d share a few tips to help you get the most out of the way you use it. Just ask Hannibal Smith – one of the great joys in life is when a plan comes together. With Slack, it’s easy to join multiple channels but then you have the difficulty of staying on top of what’s new or important. Star the channels that you use most regularly to ensure they stick to your side menu, and for others, go to Preferences – Advanced Options – Channel List and hide those which have no unread messages. It keeps your panel looking tidy and aids productivity. Channels can move quickly, especially if you have a large team or a fast-moving project. 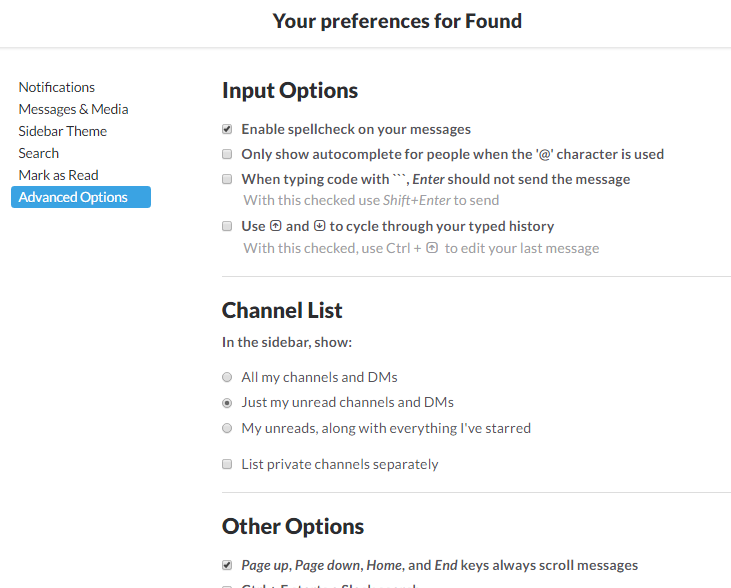 Using search functions such as: ‘in:’, ‘from:’ and ‘to:’ This will help you track down specific messages you’re looking for anywhere in Slack. If you’re going into a meeting or grabbing some lunch, use the /away command to let coworkers know. 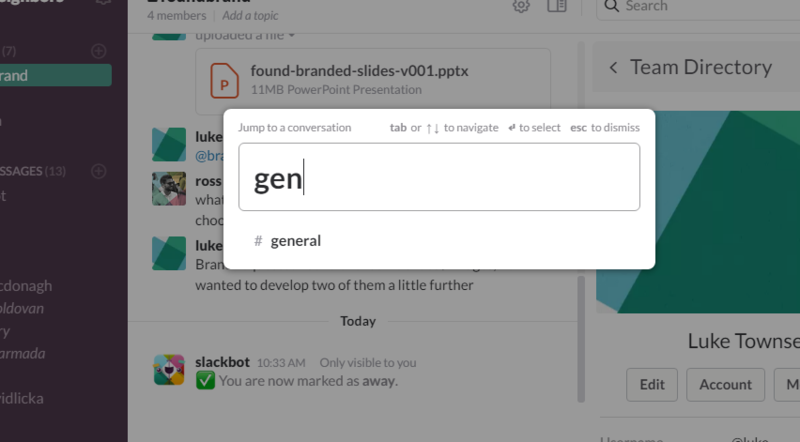 If you’re tracking a specific topic and want to be alerted whenever it’s mentioned, first select your name in the top-left corner of Slack and then click Preferences. In the menu that drops down, select Notification Settings, followed by Highlight Words. You’ll see a free-text box where you can add the keywords or phrases that you want to be notified of any time they appear in one of your channels. To add multiple keywords, separate them with commas. By integrating the Notify app, every time your brand gets a mention on a social platform such as Twitter, Instagram or Tumblr, you get a notification. You can track not only mention of your brand names, but also keywords you’re interested in so that you can easily monitor what’s being said about you online. If your organisation is anything like Found you probably find yourself answering the same question more than once on a Slack channel. This is where the very clever Slackbot can come in extremely useful. You can ‘train’ Slackbot to respond with an automated message every time a keyword or phrase is typed into a channel. No longer does anyone have to respond to ‘Whats the office phone number?’ or ‘What are the Found brand colours? 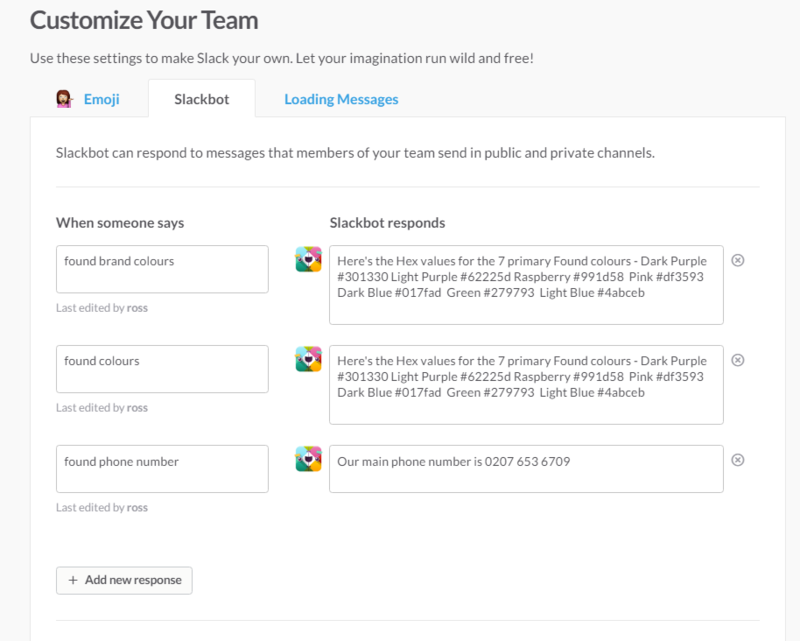 With a simple command, the Slackbot will do that for you. 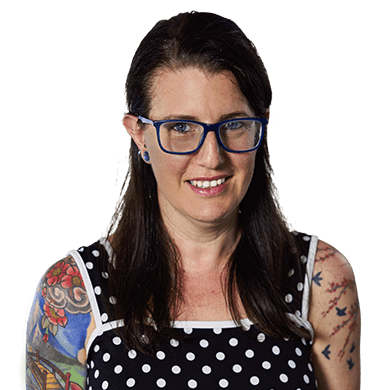 We all have occasions where we’ve said something that we instantly regret – how many times have you attempted to recall an email before the recipient reads it? Happily, if you do make a boo-boo, you can quickly edit your comments on Slack by hitting your↑key and clicking Edit, then Enter. It doesn’t guarantee your message won’t have already been seen by half a dozen people by then, but it’s better than nothing. 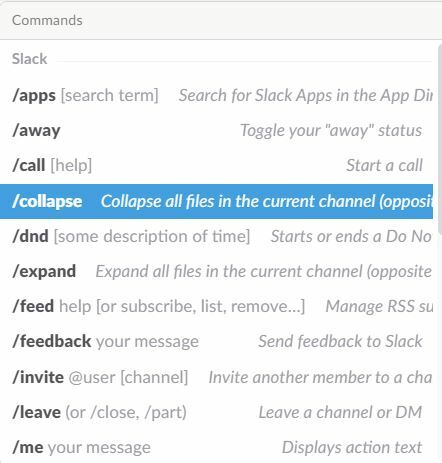 Built-in to Slack are multiple keyboard shortcuts that can make life so much easier, and although each will only save you a couple of seconds, it all adds up! Hitting Command + / brings up the complete list, then it’s just a matter of memorising the ones you want. Many businesses use Google Drive for easy online storage, and to integrate it with Slack, all you need to do is paste a link to a file in Drive into Slack, and the Slack Bot will give you the option of connecting either to just that file, or to any others you link to from that point onwards. Want to detach from Drive at any point? Reconfiguring the integration is the work of a few clicks. IFTTT (If This, Then That) lets you create what it calls ‘recipes’ – conditional chains. Either use an existing account or sign up for one, then follow this link https://ifttt.com/slack to integrate it with Slack. So, say you’re in the business of Cloud storage solutions, you can automate it so that any time this subject is mentioned on a news website such as the BBC, a link will instantly appear in your chosen channel. That’s just one example – there is unlimited potential for conditional commands you can set up. When you have a big team with lots of different channels running, you want to be able to switch between conversations quickly and easily. Click ⌘ + K (for Mac) or Ctrl + K (for Windows and Linux) and a pop-up box appears. Begin typing the name of the channel you want, then select from the dropdown list. A convenient time-saver. Integrate Slack with Stats Bot to get real-time metric reporting – your users, bounce rates, session length – for any time period or to get a quick site overview report at any point. Many marketers fall down the Google Analytics wormhole, but by integrating this app you can get a quick snapshot at any point and then get back to your main tasks. When launching it in your own business, it makes sense to develop an official usage policy early on so that everyone is on the same page, or rather in the same channel. That might include muting notifications to avoid distraction, insisting that any mentions of users in comments made after office hours are only vital ones, and letting admins adjust Off settings, as this app can be seriously addictive. Also, don’t forget that Slack are really nice. If you’re a nonprofit or educational institution then you can take advantage of special pricing, with discounted or even free-of-charge annual subscriptions. Pretty cool.